Yesterday, the Pennsylvania Supreme Court published its 5-2 decision in the case of Gillard v. AIG Insurance Company, 2011 WL 650552 (Pa. Feb. 23, 2011, Saylor, J. )(McCaffery, J. and Eakin, J. dissenting) ruling that the attorney client privilege not only applies to communications from the client to the lawyer, but also to communications from the lawyer to the client. In so ruling, the Court eradicated the uncertainty on the issue presented created by the Court's previous plurality decision in the case of Nationwide v. Fleming. 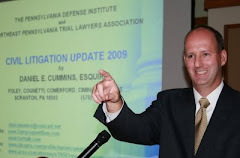 Writing for the Court in Gillard, Justice Saylor unequivocally stated, "We hold that, in Pennsylvania, the attorney-client privilege operates in a two-way fashion to protect confidential client-to-attorney or attorney-to-client communications made for the purpose of obtaining or providing professional legal advice." Majority op. at 23. Justice Saylor was joined in his majority decision by Chief Justice Castille, and Justices Baer, Todd, and Orie Melvin. Justices McCaffery and Eakin each wrote dissenting opinions.